You’ve probably heard about the benefits of nature and outdoor play for children. According to the National Wildlife Federation, outdoor play boosts fitness and decreases the risk of childhood obesity; increases focus and academic achievement at your child’s daycare; and reduces stress and increases feelings of well-being. As a provider of early childhood education and daycare, we understand and agree with all these findings. While less tangible and quantifiable, the “fun” value of being outdoors can also be beneficial to children, particularly when they can share that fun with a beloved adult. Conservationist Rachel Carson wrote, “If a child is to keep alive his inborn sense of wonder, he needs the companionship of at least one adult who can share it, rediscovering with him the joy, excitement, and mystery of the world we live in.” We think she’s onto something there. This article contains a few simple outdoor activities for kids that can help nurture a love of the natural world within your child. Offer safe spaces for babies to crawl, walk, and explore, such as a variety of textured surfaces (e.g. grass, sand, or dirt). Point out and label birds, squirrels, insects and plants. Toddlers are at a vantage point to observe things that we adults often miss. A simple walk around the neighborhood with the family can open a whole world to them if we simply slow down. Make time to explore with toddlers, keeping in mind the journey, not the destination. How many plants and insects can you find? How many different textures or sensations can you discover? Offer your child a variety of natural and re-purposed materials, such as old metal pie tins, sticks, ribbon, wire, spoons, shells, or rocks. What can you make with these materials? How about wind chimes, a bird feeder, or an old-fashioned mud pie? Speaking of old-fashioned fun, remember Winnie the Pooh and his game of “pooh sticks”? Gather several sticks of similar size and give each player a stick. On the count of three, drop the sticks from one side of a bridge. Run to the other side and watch for the sticks to float downstream. Which stick emerges first? Based on the natural world you see around you, improvise fun outdoor games for kids. Get an up-close view of pond life. Cut the ends off a large cylindrical plastic container, such as a large food container or even a milk jug. Secure plastic wrap over one end with a rubber band or waterproof tape. Place the wrapped end of the container in a stream or pond. Look into the other end. The glare of the sun is diminished when looking through the container, so it’s easier to see plant and animal life in the water. Grow something. 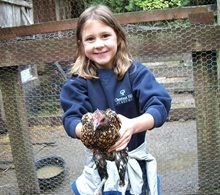 School-age children are at an ideal age to learn about gardening. If you have the space, you can try easy-to-grow crops like lettuce, carrots, peas, and tomatoes in a full-size garden, a raised bed, or even pots. Try fast-growing flowers like pansies, nasturtiums, or sunflowers. How about a few herbs on the patio? When asked why he felt optimistic that humans would find solutions to the environmental concerns plaguing our planet, physicist Freeman Dyson responded, “Because people will always love trees.” If children are removed from nature, though, will future generations develop this age-old wisdom? We believe that experiencing nature with children through outdoor play at your daycare has benefits today and for years to come as children become the stewards of our planet. So, get out there. Turn over a rock. Feel the breeze on your face. Get some dirt on your shoes.